When Maxine moved into a condo, she managed to get a community garden plot across the street. That garden became her life. She could see it from her balcony. She grew flowers, ate off her vegetable harvest for months, used only “safer soap” (as the garden rules required), and made many friends there. It was in her garden plot that she had her stroke and where fellow gardeners found her and called 911. In going through her things, her daughter found a note she had written ages before, asking that when she died her ashes be sprinkled on her community garden plot. Other co-gardeners planted a cherry tree and put up a sign reading: “Maxine’s cherry tree, the community garden queen.” Then a few years ago, the land was taken over and built on by a children’s hospital, but the garden, including the tree and the sign, was dug up and moved to a nearby park. Her daughters visit regularly. 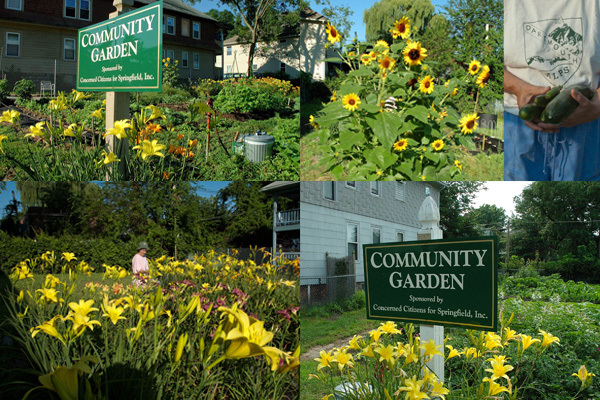 Community gardens are much more than they seem.